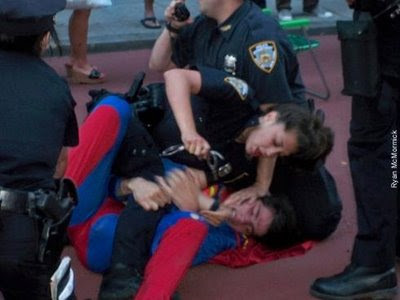 Friend of the Revolution Ken sent us this link to a story about Superman using brute force against New York City police officers. As always, Batman used his superior intelligence to sit nearby, handcuffed to a lawn chair. Oh, Superman... it has all gone downhill for you since "Superman Lives." On the bright side, that cop that is putting the cuffs on is going to be famous.